For more than a decade, Melissa Harris-Perry has contributed to American public life through her distinct combination of scholarly analysis and ordinary wisdom applied to the analysis of race, gender, politics, and power. Her writing has appeared in the Wall Street Journal, New York Times, Chicago Tribune, and many other print and digital venues. She was among the initial cohort of writers for TheRoot.com and authored highly regarded columns for both Essence and The Nation. Currently, she is editor-at-large of Elle.com and a contributing editor at The Nation. As editor-at-large, Melissa Harris-Perry acts as a guide to the stories, experiences, challenges, policies, and defining pop culture moments of women and girls of color. Working with ELLE.com gives this Wake Forest University college professor and mother of two a great excuse to shoe shop in New York City. Predawn hours are reserved for gardening. Melissa Harris-Perry and Yolanda Pierce have been friends and co-authors for more than a decade. In 2008 they gained national recognition for their honest and insightful joint writings on a blog entitled The Kitchen Table. In the intervening decade the friends have broken historic barriers in their professions while raising daughters to young adulthood. They have returned to The Kitchen Table. In this groundbreaking book, Melissa Harris-Perry uses multiple methods of inquiry, including literary analysis, political theory, focus groups, surveys, and experimental research, to understand more deeply black women's political and emotional responses to pervasive negative race and gender images. Not a traditional political science work concerned with office-seeking, voting, or ideology, Sister Citizen instead explores how African American women understand themselves as citizens and what they expect from political organizing. Harris-Perry shows that the shared struggle to preserve an authentic self and secure recognition as a citizen links together black women in America, from the anonymous survivors of Hurricane Katrina to the current First Lady of the United States. 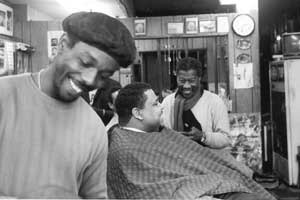 Using statistical, experimental, and ethnographic methods Barbershops, Bibles, and B.E.T offers a new perspective on the way public opinion and ideologies are formed at the grassroots level. The book makes an important contribution to our understanding of black politics by shifting the focus from the influence of national elites in opinion formation to the influence of local elites and people in daily interaction with each other. Arguing that African Americans use community dialogue to jointly develop understandings of their collective political interests, in a framework of contemporary black political thought.